Dr. Schechner has been living in Northwest Indiana since he was three years old. He graduated from Merrillville High School and completed a B.S. Degree from Purdue Calumet. Dr. Schechner received his dental degree from Indiana University School of Dentistry in Indianapolis, and his Pediatric Dental Certificate from Case Western Reserve University located in Cleveland. Dr. Schechner has been very active in the Indiana Dental Association and served as President in 2011-2012. He has also been active in the local dental society where he served as President and Trustee. Dr. Schechner has been married to his wife, Lore, for almost 36 years and has two children. His hobbies include golf (although not very good), travel, landscaping, and reading. Dr. Schechner will be starting his 30th year of practice this upcoming year. 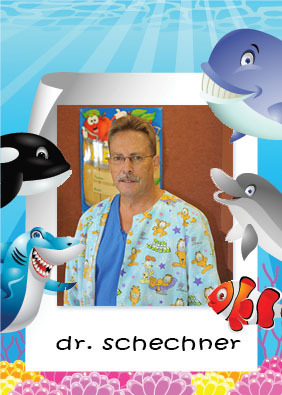 Dr. Schechner is dedicated to making your child’s dental experience as pleasant as possible. He looks forward to serving your children’s dental needs.